I haven’t had much experience when it comes to producing video virals. However, last Friday that all changed. Reading this you may not be aware that I perform in a double act called Young and Strange (www.youngandstrange.co.uk). We perform larger scale illusions that are intended for the stage and after dinner corporate events. 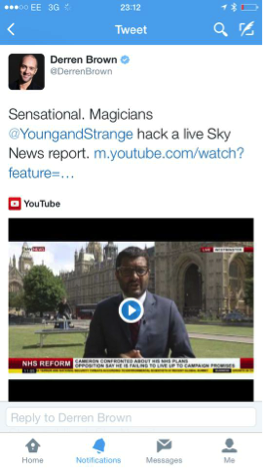 We were aware that the shorter video is more suitable as a video viral but weren’t quite prepared for the speed at which the video would spread. On Friday morning it had about 4,000 YouTube views and within 48 hours it had amassed over 3 million. It’s important to mention that was on YouTube alone and didn’t include the video which was shared on almost every viral website around the world. On a video sharing website called ‘The Poke’ it was pushing 7 millions views. It appeared on TV in America and pretty much all of the reputable newspapers picked it up as a lead online story. These included Time magazine, Cosmopolitan, The guardian, The telegraph, The Independent, The Sun, The Mail, The Mirror, The Radiotimes, The Metro and (our personal favourite) Pink News, which was ‘keen to run an article with any links you have to LGBT community’. This is still a fresh and evolving story so it will be interesting to see how big it will become. 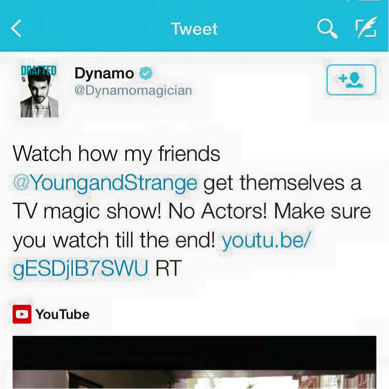 For any future videos, do keep your eye on our twitter feed (@youngandstrange).